Often when speaking with other aquarists and I'm talking about all of them, catfish fans or not, I'm interested in what they're up to, what they get from keeping the fish they do. In such conversations, you get a view of the fishkeeper as much of their fish. In speaking with Adrian Taylor, webmaster of AsianCatfish.com (Ed's note: now defunct) and long time aquarist, I couldn't fail to come away with a sense of admiration. Here's a guy keeping and learning about fish many overlook, but not only that, he's breeding them, absorbing and keeping abreast of emerging scientific knowledge and articulating what he gathers via his web site and in the following article. For me, this the paradigm of how it should be done. With that introduction, here's Adrian's CotM article. Dorsal view showing 'anchor' shape. Hara jerdoni is one of the most easily recognisable members of the genus Hara, and one that is quite readily available in our stores. Although this diminutive Hara has all the attributes that indicate that it is one of the so called "Moth cats"; it is more commonly referred to as the dwarf anchor cat, due to it looking like the anchor of a ship when viewed from above (see image to left). Again, like all Hara species the serrae on the anterior edge of the pectoral fins are all antrosely directed as shown in the drawing below, right. Drawing of pectoral fin spine serrations. Hara jerdoni are found in rivers, in and around North East India and Bangladesh; it is thought that they use their strong pectoral fin spines to lodge themselves into any nooks and crannies that they can find when their rivers are in spate. Like most ‘Moth cats' their colouration can vary from a rich ruddy brown to an almost dark earthy brown that contains a few darker blotchy areas, especially around the head. This change in colouration is more than likely down to seasonal changes in what food is available to them. I have noticed that when they are purchased with this rich ruddy colouration, it isn't long before they become the dark earthy brown colour previously mentioned. However, when fed as a sustained part of their diet, newly hatched Artemia, the colouration will again change back to the rich ruddy brown. The majority of Hara jerdoni that we find in our local fish stores are usually coloured a dark earthy brown. This is also the case with most species of Hara, but after being fed upon a diet rich in Artemia nauplii, especially if the Artemia nauplii are the type that has a rich vibrant orange colouration to it, they can become this rich ruddy colour again. Of all the Moth cats, Hara jerdoni is probably the most delicate, and if close attention to water quality and diet is not given, their mortality rate can be high; if not a total loss. Provide water that has a pH value between 6 and 7.2 with a temperature ranging between 18°C and 22°C. Although is has to be noted that they will survive at higher temperatures as long as there is a high level of dissolved oxygen in the water. Nitrates above 12.5mg/l are not tolerated, so close attention to water quality is a must. The first indication that there is something amiss with the water quality is that they appear to shed their skin; and usually upon carrying out a water quality check, a nitrate reading of over 12.5mg/l is more often than not found. In their natural environment Hara jerdoni feeds upon small invertebrates and although it has been claimed that they readily accept prepared commercial foods, they do better when fed upon a diet of live food, supplemented with similar frozen foods, such as small bloodworms, grindal worms, micro worms, sifted daphnia, cyclops and brine shrimp nauplii. 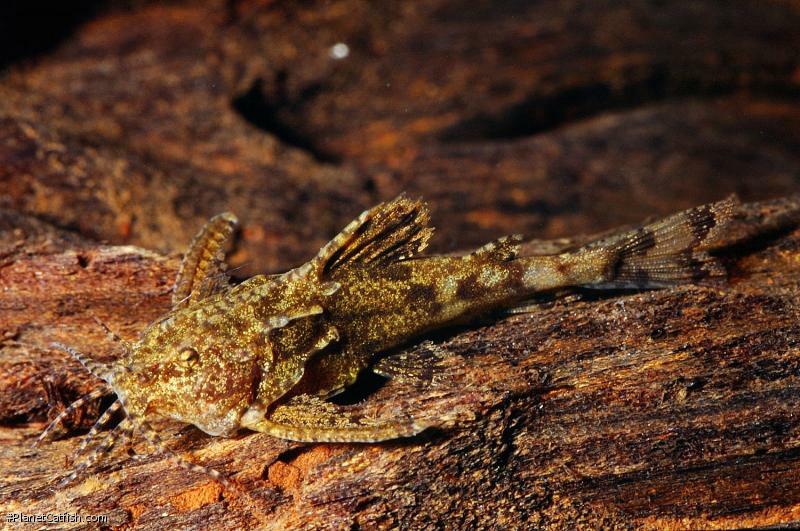 This species' diminutive size makes it an ideal catfish for the smaller, well-planted aquarium, although some small stones and bogwood with grass like plants would be beneficial as somewhere for them to retire to. Boisterous tank mates should be avoided; fishes such as Rasbora brigittae,Rasbora espei and Celelestichthys margaritatus make excellent tank mates. Spawning these is possible, if one is attentive, but the fry are very delicate and require plenty of time and attention in order for them to be reared to an acceptable size. Type Locality Sylhet dist., Bangladesh. Etymology The generic name comes from the local name for the fish. The species is named after TC Jerdon. Size 30mm or 1.2" SL. Find near, nearer or same sized spp. Identification Easily distinguished by its small size and extremely long pectoral spines (which reach beyond the pelvic fin bases). General Remarks An extremely shy fish, not often seen. Its eyes can turn from a dark brown to a beige colour, the entire fish can turn shades of brown and tan to blend in with surroundings. Distribution Known from the Ganges and Brahmaputra River drainages in the northern part of the Indian subcontinent. Other Parameters Make sure water is amply oxygenated, as it does not tolerate a drop in dissolved oxygen well. Feeding Will eat a variety of live and prepared foods, with the former being preferred. Furniture Provide ample vegetation (rather than driftwood or logs) for the fish to hide amongst. A sandy substrate is also preferable. Compatibility An ideal community fish due to its small size and peaceful nature. Suggested Tankmates Goes well with most community fish. Ideal tankmates for a biotope setup would be small Indian fishes such as Dario dario, Puntius gelius and Schistura corica. Breeding This species has been bred in the aquarium. There are 79 registered keepers, view all "my cats" data. 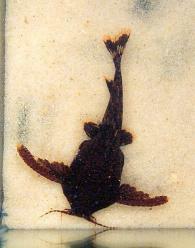 There are 14 records of this fish being seen, view them all.